Eddie Izzard is all set to take on the universe again with his new world comedy tour ‘Wunderbar’. Five years after his last comedy tour Force Majeure made comedy history when he performed in 45 countries including all 50 US States and in four languages, which made it the furthest reaching, most encompassing comedy show of all time.,Eddie has gone back to his roots with an all-new and intimate show which delves into his own very unique, totally surreal view of life, love, history and his ‘theory of the universe’. ‘Wunderbar’ was birthed at La Nouvelle Seine, a floating theatre in Paris on the Seine where Eddie began to improvise his new show in French. He then skipped countries and went on to develop the show, improvising in Berlin in German. Now after more development in English, Eddie is ready to share ‘Wunderbar’ with the world… But will make sure the language fits the country! 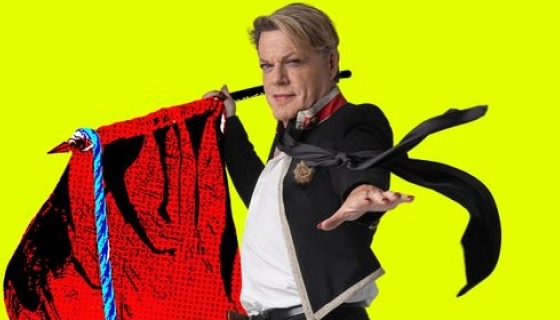 ‘Wunderbar’ is an intricate insight into the surreal and fantastical world of Eddie Izzard. This is intelligent Bunkum of the highest order.